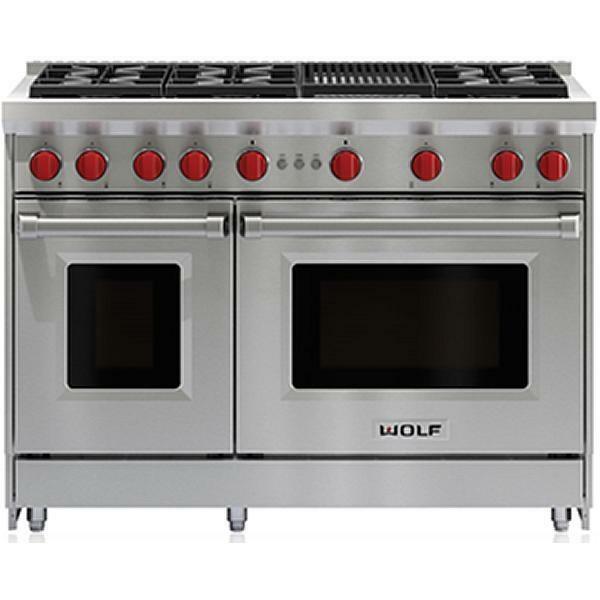 Wolf 48-inch gas range with 6 burners and an infrared charbroiler. 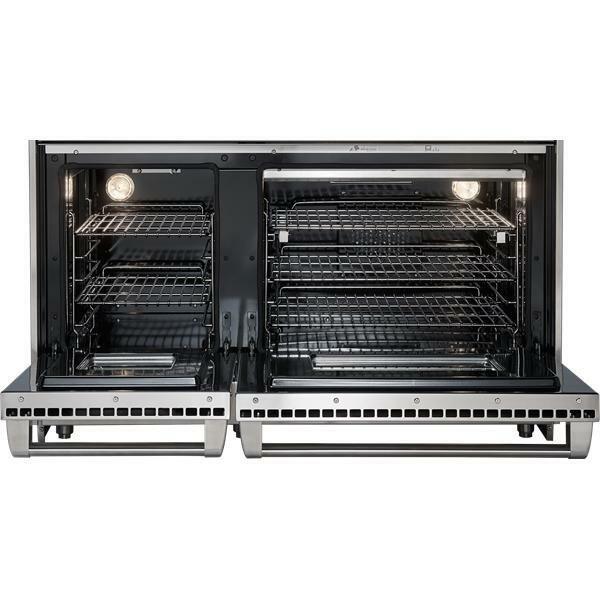 Six dual-stacked burners give you the highest highs down to the lowest lows, while an infrared charbroiler whips up succulent steaks, burgers and more. 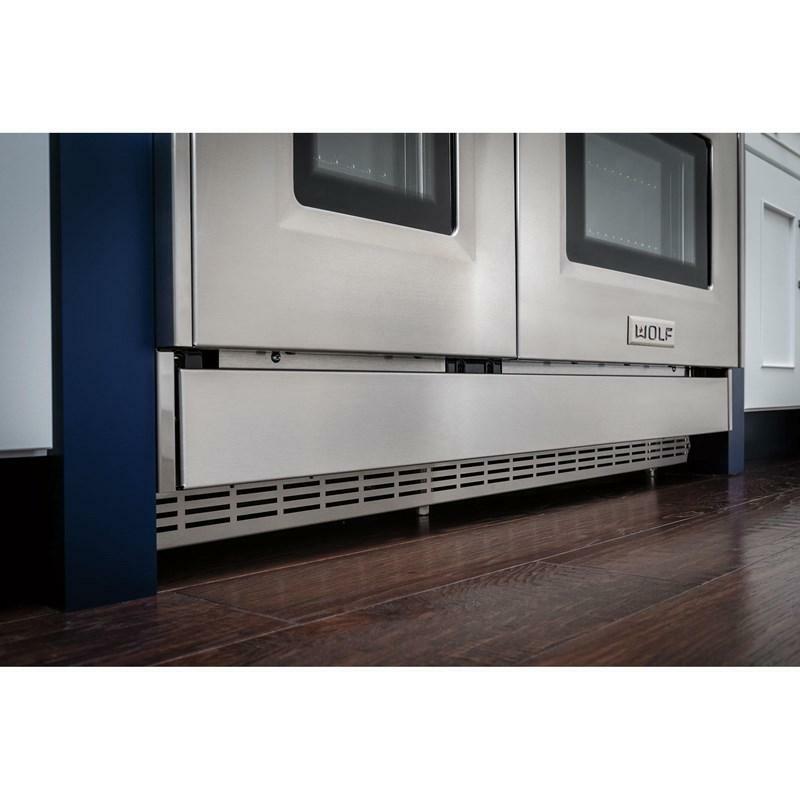 Down below, the spacious gas convection oven provides even, consistent heat across all racks, with none of the hot and cold spots that can make roasting or baking such an iffy proposition. 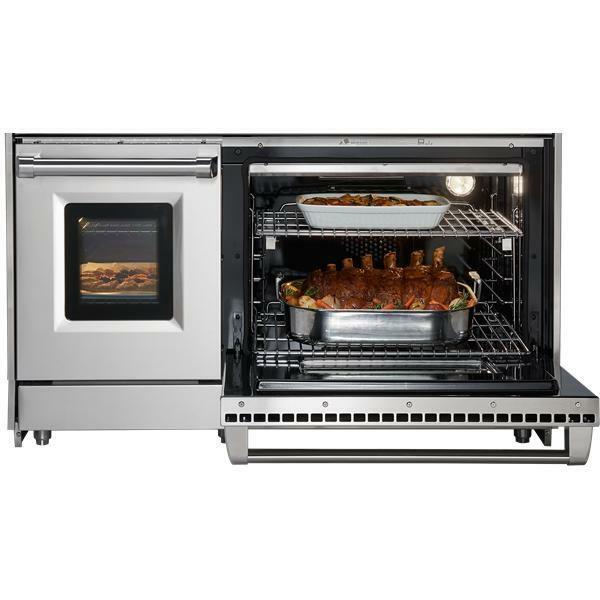 It has an infrared broiler that sears quickly and evenly. 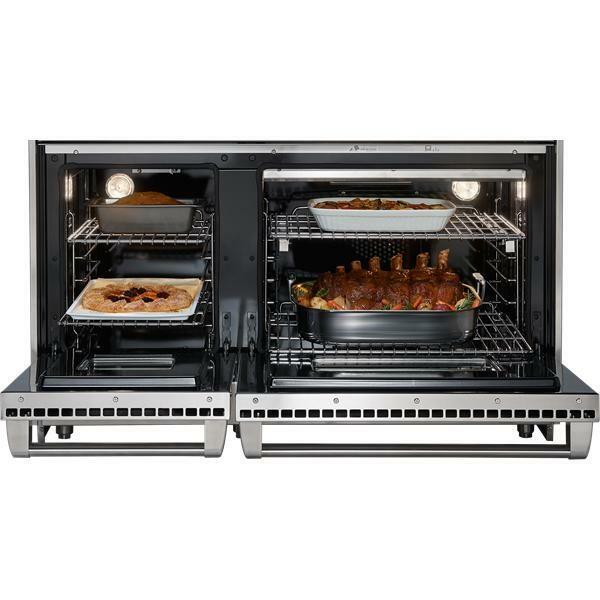 And there’s even a second non-convection 18" oven for quick preheats of smaller meals. Whether you're shopping for appliances or have questions about those you already own, the Sub-Zero, Wolf, and Cove Customer Care team has a reputation for service that's as exceptional as its products. They're based in Madison, Wisconsin, just footsteps from the factory, and are standing by to provide expert, friendly, problem-solving support. 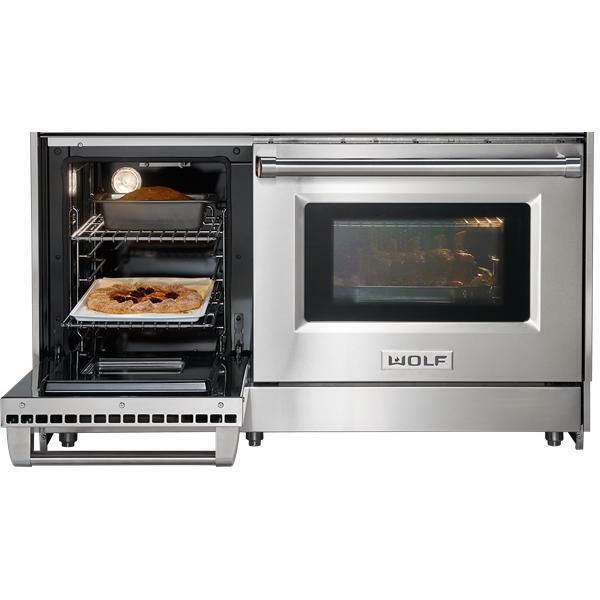 Large capacity convection oven heats quickly, cooks evenly for more consistently delicious results. Bring new dimensions of control to your cooking. 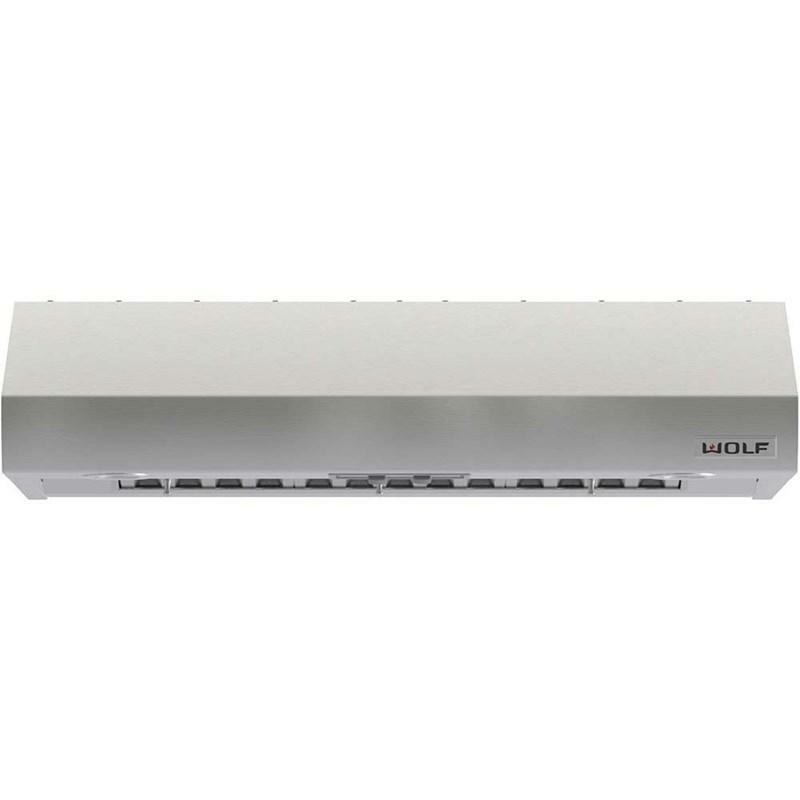 Wolf's dual-stacked burner design, with two tiers of flame ports, bring the flame closer to (or further away from) the cooking vessel to deliver the right heat for the task at hand. 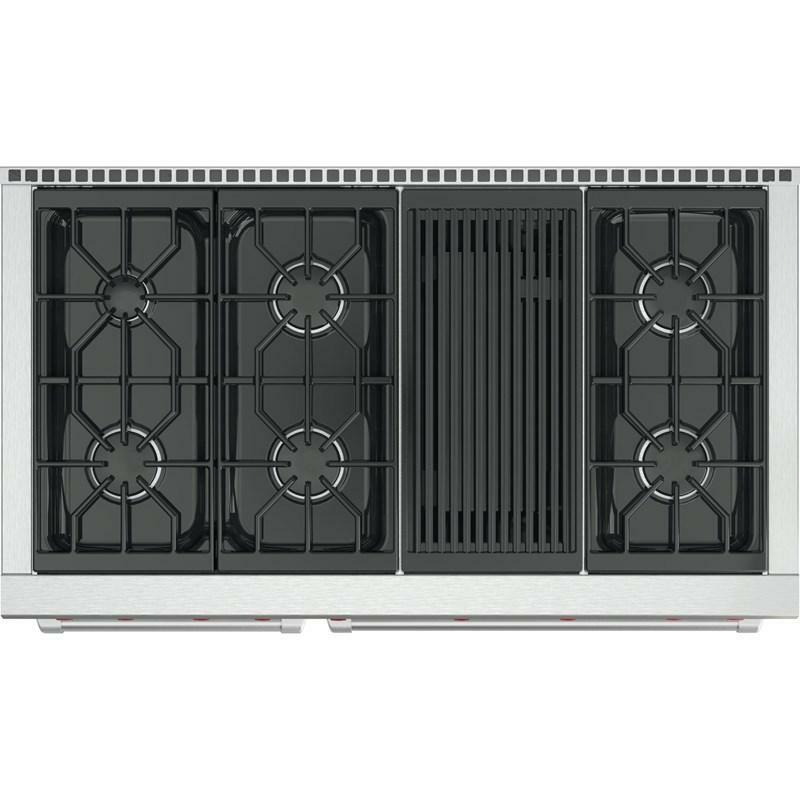 Each burner has a sensor that detects if the flame has gone out while you're cooking and automatically re-ignites it for improved temperature control and added safety. Capacity (cu. ft.) • Total Capacity: 6.9 cu.ft. 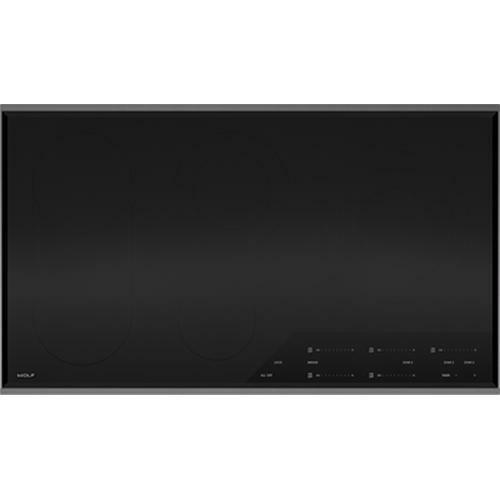 • Large Oven : 4.4 cu.ft. 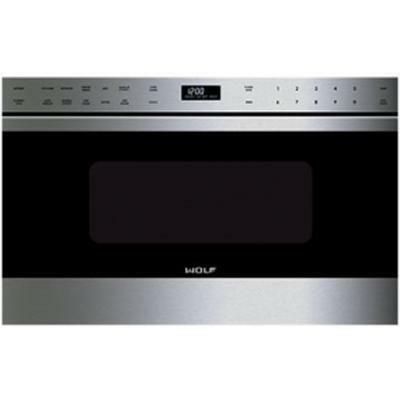 • Small Oven : 2.5 cu.ft. *While we place great care into preparing product descriptions and prices, sometimes technical and typographical errors or omissions may occur. Bakers Appliances cannot be held responsible for such errors and we apologize for any inconvenience this may cause. High value for the price you pay. 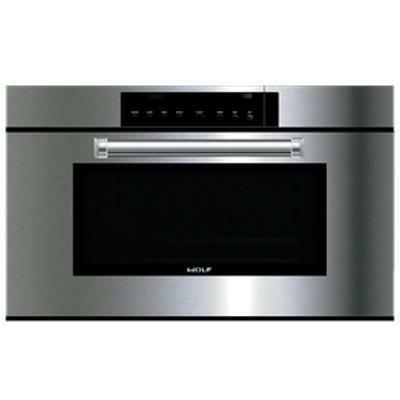 Bakers Appliances offers a wide variety of Appliances. 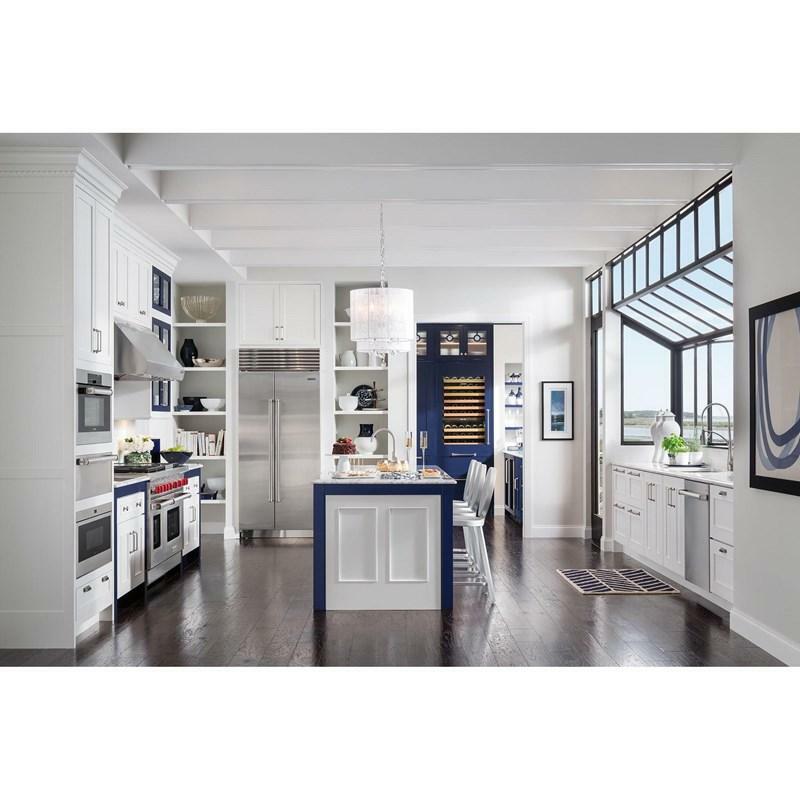 We have thousands of products to choose from, whether you are looking for kitchen appliances, laundry, ventilation, small appliances or bbq's. 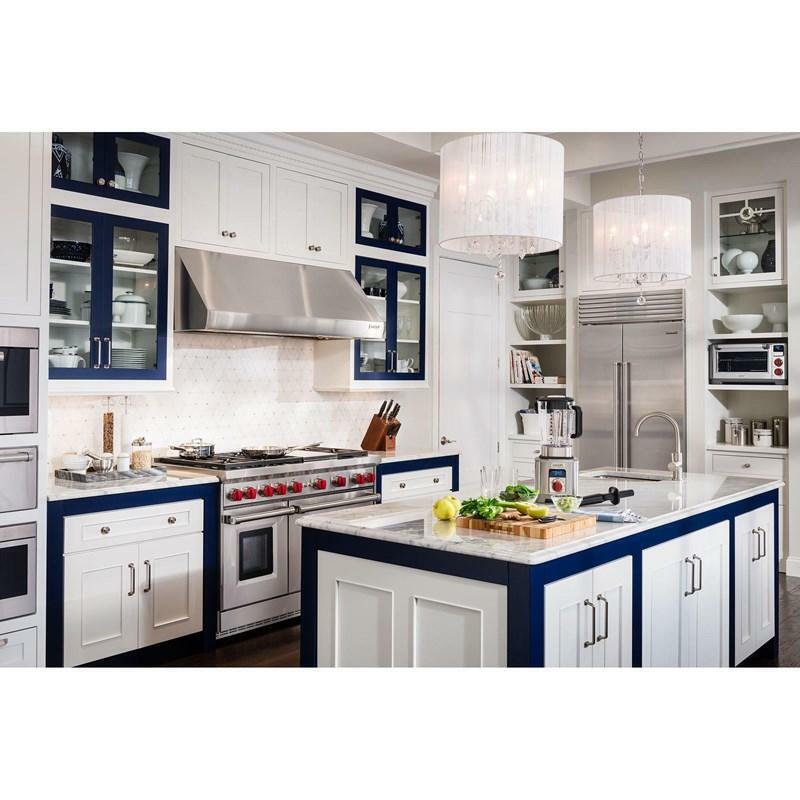 We are proud to carry many of the top named North American brands such as: GE, Jenn-Air, KitchenAid, Maytag, Wolf Applaince, Moffat, Bosch, Whirlpool, Frigidaire, Broil King & Napoleon Grills, just to name a few. Come visit Bakers Appliances at 1107-2nd Ave. South, Lethbridge, Alberta T1J 0E1. I agree to receive the Bakers Appliances newsletter containing news, updates and promotional offers. © Bakers Appliances 2019 | All rights reserved.